This luxurious seat conveniently nestles into any corner to create a personalized oasis. hand selected Brazilian Walnut panels and a contemporary trim to blend seamlessly with adjacent bath accessories. Discrete wall mount with a 500lbs / 227kg weight capacity. 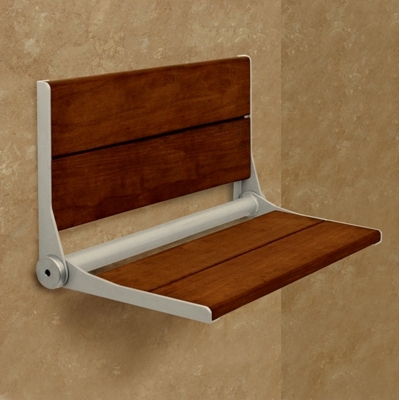 Two 18.5"/47cm concealed wall mount brackets maximize wall contact and spread the weight-bearing surface to create an exceptionally solid seating surface. Convenient seat doubles as a shower caddy and features a streamlined design that is sure elevate the look of any shower. Brazilian walnut seat-Beautiful Brazilian walnut is naturally resistant to moisture, mildew and decay. Known for it's considerable strength, it is up to 3 times stronger than teak and requires very little maintenance to preserve its natural beauty.